It struck Mr Mustard that there were parallels with the parking penalty charge notice system in which, across London, 47% of tribunal Appeals were successful. In the majority of cases there will have been two chances for the council to cancel the PCN, the first when considering the informal challenge received in response to service of the PCN & the second when considering the formal representation made in response to the Notice to Owner. Mr Mustard thinks that the rejection of the informal challenge is almost routine and that the council can chance their arm in rejecting because the motorist is more worried about losing the 50% discount than anything else. Mr Mustard doesn't worry about the discount as he has the experience to correctly guess, most of the time, what the outcome will be at adjudication. Here is an example of Barnet Council needing two opportunities to make the correct decision. I represent Jane Doe as attached authority. She was parked wholly outside number 23 (I should know, I live next door). Jane's car therefore was not within the suspended area and no contravention has occurred. (Incidentally the removal lorry had already departed and it would be helpful to residents if you didn't suspend bays until midnight which is not necessary for household removals). This time, the council accepted them. You have to ask yourself why the council rejected the challenge the first time when clearly it was a valid one? 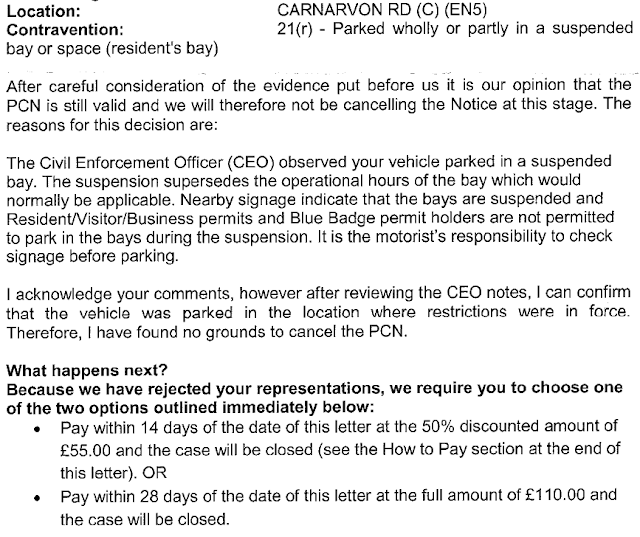 You might think it is cynical behaviour on the part of the council as they know what most people don't, that you can challenge a PCN (one placed on your car) three times (only twice for a postal PCN). In this case the council wisely decided not to chance their arm at the tribunal as they were facing a pretty certain loss & they have to pay a tribunal fee of £30 (no charge for the motorist). If you now look at the table above you can see the percentage of occasions on which the council got their decision wrong. Barnet are up there in the top quartile of the leader board. Do please continue to take your PCN to the tribunal if you think it is wrong as you do get an independent review of your PCN unsullied by the prospect of extra revenue for the tribunal who are funded by fixed price payments per PCN by enforcement authorities. Put more simply, an adjudicator will not find against you because he/she profits by it, unlike councils who want the revenue and are under pressure to meet their annual projections. The system needs to be redesigned to remove the incentive for councils to issue more PCNs and to refuse more challenges. 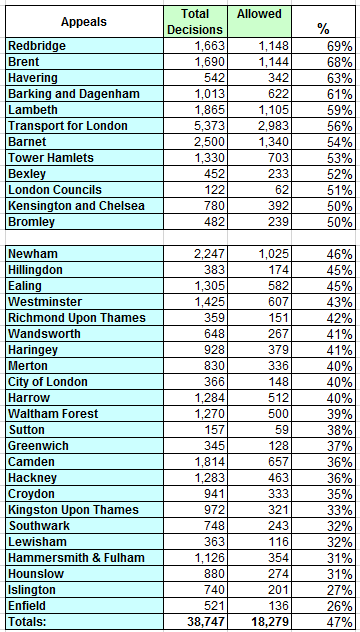 Sharp eyed readers will have noticed that if you were to sort the above table in size order of the number of parking PCNs taken to Appeal at London Tribunals, Barnet Council come out as the council whose PCNs get taken to the independent tribunal more often than any other council in London (TfL not being a London council). Well done to the residents of, & visitors to, Barnet who are clearly becoming more independent & leading the fightback against unfair ticketing & revenue raising.